What makes a good death? In her new book, From Here to Eternity, mortician Caitlin Doughty travels the world to find the answer, and documents the myriad ways humans deal with their dead. 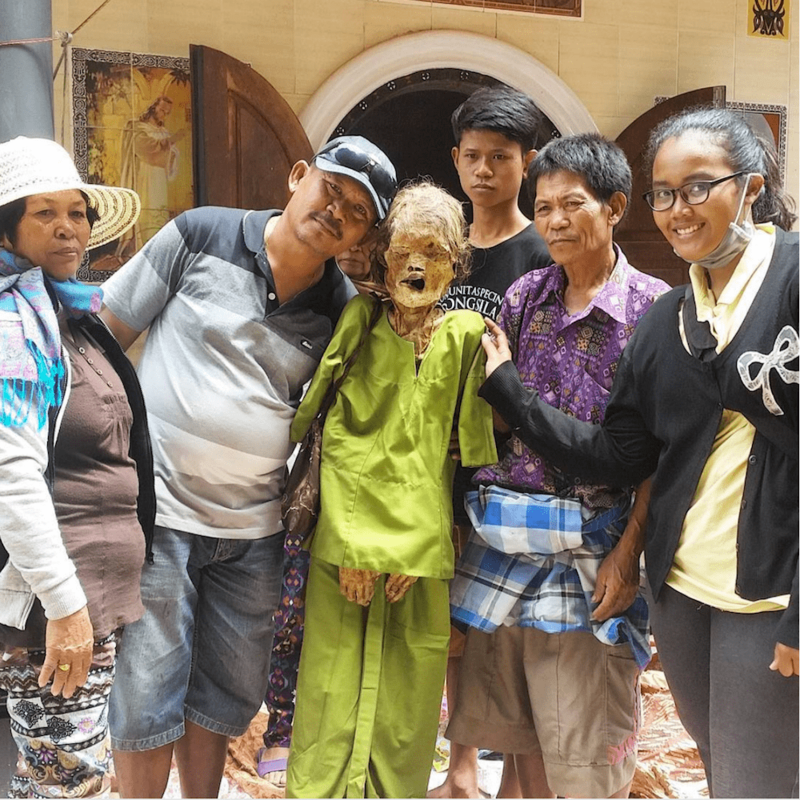 In Indonesia, for example, some families mummify their deceased loved ones, and bathe and dress them before important ritual gatherings. And it’s no solemn affair—younger family members pose with the mummies and post the pictures to Instagram. Or consider the gentle ritual Doughty found in Japan, where family members use chopsticks to pick the bones of their loved ones from cremation ashes, placing them one by one in an urn. She points to those traditions as healthy ways to deal with mortality. Contrast that against the United States, where “removing money and profit from death is almost unheard of, mostly because it is so difficult to accomplish,” she writes. Throughout the book, Doughty challenges us to develop a better relationship with mortality. Talk to your loved ones about death before they pass. Ask to spend more time with their bodies before they’re taken away. Show up for the cremation, and ask to help fire up the machine. In other words: “We won’t get our ritual back if we don’t show up.” She joins Ira to discuss. Most people have no idea how much power they have around their own dead. The funeral home—me as a funeral director—I don’t control your mom’s body. That’s entirely up to you to make those decisions, and it’s completely safe and legal for you to take a little bit more charge when the time comes. They have done the amazing feat of really stepping outside of the American funeral industry. If somebody dies, they come to your house and help you take care of the body. And then two or three days later they process to this gorgeous open air pyre at dawn and they set you alight and the smoke twirls into the sky and the flames rise up. And even if you’re not a spiritual person, it feels like a spiritual moment when you’re there. It’s the idea of natural burial—just a simple burial with no embalming—but it’s also protecting endangered land, protecting land that might otherwise be developed on. But when you bury a body there, they can’t develop on it. I say it’s like chaining yourself to a tree, post-mortem. And I would like more big environmental groups to be involved in this, and to really consider these beautiful spaces as the future of death. People always ask me: “Shouldn’t we just donate our bodies to science?” And I hate, hate, hate that sometimes I have to hesitate in my answer…People who are donating their body to science think they’re going off to cure cancer and to study these very noble things, but in fact they’re being used for plastic surgery training, they’re being used for parts, essentially. And if you’re cool with that, absolutely give your body up to science. But if you’re not ok with that, please do your research before you decide to donate. One of the things that I think people don’t understand is that it’s a huge barrier to entry in the funeral industry. It’s highly over-regulated, and it’s often the funeral home lobbies in individual states that want to keep it highly regulated. So younger women, minorities, immigrants, aren’t able to open funeral homes that would compete with the status quo: embalming, hearse, casket, funeral home. They preserve their dead bodies with formalin, with these chemicals. We preserve our dead bodies with formalin, with these chemicals. It’s not all that different. But we of course would think about bringing the dead bodies out as horrifying. But my question there is: They have a reason for mummifying their bodies with all these chemicals. Why are we doing it in the United States if we don’t intend to bring Mom out a couple years later? Caitlin Doughty is a mortician, activist, and author of From Here to Eternity: Traveling the World to Find the Good Death. IRA FLATOW: This is Science Friday. I’m Ira Flatow. With Halloween just around the corner, we thought we’d talk about death because you see so many death related icons associated with Halloween, and perhaps that’s because death is big business here in the US. The industry takes in $16 billion a year from funerals that average around $8,000 a piece. And for most Americans, the choice is simple, cremation or burial. Neither of which is a very green option because cremation consumes lots of natural gas and releases toxic chemicals, and bodies are often loaded with embalming chemicals before burial. But green tech is sneaking into the funeral business too. This month, California Governor, Jerry Brown, signed a bill allowing so-called water cremation, also known as alkaline hydrolysis, making California the 15th state where the process is legal. Water cremation spares the fossil fuels, and toxic chemicals, and dissolves the body, leaving behind only liquid, and powdery bones. So now some Americans have three options for what happens after a life but there are many more. And my next guest crossed the globe– crisscross the globe to document the many ways we deal with death. The topic of her new book, From Here to Eternity: Traveling the World to Find the Good Death. Caitlin Doughty is the author, and she’s a mortician and funeral home owner in Los Angeles, and she joins us from WBEZ in Chicago today. Welcome to Science Friday. CAITLIN DOUGHTY: Such a pleasure to be here. IRA FLATOW: So tell us a bit about your day job. You own a funeral home. CAITLIN DOUGHTY: I do. There’s no typical day at the funeral home but I do. I own a small funeral home in Los Angeles and our ethos is to get the family more involved. So whether the person wants to say keep mom at home for a day or so, whether they want to push the button to start the cremation, whether they want to put the dirt on the grave, we want the family to be more involved. IRA FLATOW: Now you write in your book that most people don’t realize they have these options. CAITLIN DOUGHTY: They don’t most people have no idea how much power they have around their own dead. The funeral home, me as a funeral director, I don’t control your mom’s body. That’s entirely up to you to make those decisions, and it’s completely safe and legal for you to take a little bit more charge when the time comes. IRA FLATOW: You write in your book how big a business the death business is. CAITLIN DOUGHTY: It is and it’s relatively modern. IRA FLATOW: What do you mean by that? CAITLIN DOUGHTY: I mean that we talk about the traditional funeral industry. And when we hear that, you might think embalming, and the casket, and the makeup. But that’s really only been the last 100 years, the 20th century. Traditional American funerals were the person dying at home, taking care of the body at home, and carrying the pine coffin on your shoulders to the local graveyard. IRA FLATOW: Uh huh. And is it easy to open a funeral home? CAITLIN DOUGHTY: It’s not and it’s really hard. It’s easier in California than other states. But one of the things that I think people don’t understand is that it’s a huge barrier to entry in the funeral industry. It’s highly regulated and it’s often the funeral home lobbies in individual states that want to keep it highly regulated. So younger women, minorities, immigrants aren’t able to open funeral homes that would compete with the status quo, embalming, hearse casket funeral home. IRA FLATOW: You know when I read your book, I was immediately reminded of that film The Loved One from 1965. CAITLIN DOUGHTY: Yeah. It’s wonderful. And what’s especially interesting about The Loved One is that it’s about the Los Angeles funeral industry, where I’m from. And Los Angeles is really to blame for a lot of the trends in the American funeral world, including, the flat head stones, taking away the old beautiful archaic winged skull monuments, and headstones. We also have the idea of the euphemism around death, really started at Forest Lawn in Los Angeles saying, you know, the loved one or calling the body something different than it really is. The slumber room, et cetera. IRA FLATOW: Let’s leave LA for a while and talk about some of the interesting rituals you encountered on your trip around the world. None more unusual to, I think, we Americans, than the house graves in Indonesia. CAITLIN DOUGHTY: There’s a special rural place in Indonesia where they have a ritual called, the Ma’nene. And what the Ma’nene means is that they mummify their dead after the death takes place, and then even years after the death, they continue to remove the bodies from the grave. They remove the clothes, they brush and clean the mummified body, redressed them in new clothes, and really have a moment with them. Update them on what’s been going on, introduce them to a new baby, take some photographs to put on Instagram. But when you’re there, I have to say it feels really normal. It just feels like a family having a moment with a loved one. It doesn’t feel creepy, or spooky, or Norman Bates like at all. IRA FLATOW: And you write that the teenagers actually upload Instagram photos? CAITLIN DOUGHTY: They do. I am in more than one Instagram photo, smiling with a mummified family member because it’s a rural, rural area in the mountains but they still have smartphones. They still have Instagram, they still have Facebook, and they’re proud to go to this ritual where grandpa is being brought out, and they’re seeing him again. It’s just like a normal family photo. IRA FLATOW: Yeah. Well, let’s talk about cremation. This is a ritual practice the world over. But I understand, from the book, it’s very different here than it is, let’s say, in Japan or India, for example. CAITLIN DOUGHTY: It is. In Japan, I mean, for the most part, cremation is a much more interactive in other places in the world. In India, they have their open air pyres and there’s an idea that when the skull cracks open that’s the moment when the soul is released. And so it’s really hard for many Hindu families, and families that come to America, when they have to be put in this big industrial machine, and the soul, essentially, gets trapped in the brick chamber. And in Japan, they have something called, the kotsuage, which is– OK, So say, in America, when you pull out the bones after cremation, we have to grind them down in a machine called, the cremulator. But in Japan, the family stands around the skeletonized body after a cremation, and using chopsticks, they pick up the individual bones and place them in an urn. Which can sound a little much to us but I think it’s actually a really beautiful ritual and incredibly interactive. IRA FLATOW: Let’s go to the phones because you have gotten a lot of action on the phones for us. Let’s go. CAITLIN DOUGHTY: Oh good. Hi everyone. IRA FLATOW: Let’s go to Dave in Oshkosh, Wisconsin. Hi Dave. David, are you there? Uh oh. Let me– let me. CAITLIN DOUGHTY: Oh. RIP, Dave. IRA FLATOW: Hi, Dave. Go ahead. It’s my fault, not yours. DAVE: Thank you. I have a question, here. I have never wanted to be embalmed. I don’t want to be cremated. I want my body to be returned to the earth, and all the nutrients that come with that. Now I for the longest time wanted a Viking burial, where you set out to the water, and you get set on fire, and slapped into the water. But I’ve seen these new things, recently, too, that are like tree saplings. That the body is wrapped in a cloth, and there’s a tree that’s with that, and they plant it in the ground. I’m just curious what the legality is about like that around here. Is that even an option? CAITLIN DOUGHTY: Oh, I wish we had half an hour because I could get deep into all of those. But I’ll give you the short answer which is you don’t have to be embalmed, first of all, at all. It’s never legally required that you’re embalmed. So don’t let them tell you to do that. As far as the Viking funeral, I hate to, sort of, be a spoilsport here but it’s a bit more of a Hollywood idea. The idea of the flaming arrow, and the body burning on the boat, and the reason that’s true is because the wood in the boat would burn up so much faster than the actual dead body. So what you’re left with is, sort of, a half charred corpse bobbing around in the body of water. So not quite as romantic as Hollywood portrays it. But as for the tree urn, I really like them because I love that idea, but ashes after a cremation are inorganic. All the organic material burns away during the cremation process, and so you’re left with these inorganic bone fragments, and you can put them, and bury them, and try and grow a tree from them. But they’re not really helping the tree to grow. You can, kind of, hope they don’t kill the tree but they’re not helping the tree. So my personal thing is just to be naturally buried. Just to dig a shallow grave, not an embalmed body, put your body in it, and go back to the earth, and send your nutrients back into the earth where you came from. IRA FLATOW: Which brings up what I mentioned before, and I’d like a little more detail on this. California being the 15th state to allow water cremation. Walk us through that. CAITLIN DOUGHTY: We’re really excited about this, and we worked really hard to legalize it, and I hope that my funeral home will be one of the first to offer it. And what it is, is the deal with cremation, it’s often touted as the green option. That’s a bit of a stretch. A lot of natural gas is used. Enough, I believe, to fill two large SUV tanks full of gas or a 500 mile car trip. And then you also have particulate matter and things coming out of the smokestacks, including mercury from teeth. So it’s not the best. The idea behind water cremation, alkaline hydrolysis, aquamation we haven’t totally decided on the term yet, is that it’s high pressure and high heat about 300 plus degrees water. And base chemicals like lye. And what it does is that high pressure, hot environment is it flash decomposes the body down to really brittle bone fragments, similar to what comes out after a cremation. So you wouldn’t have to sacrifice getting the ashes back or getting to scatter ashes, but the process, itself, people also just– it’s a little more environmentally friendly and people just like the idea of cremation by water as opposed to cremation by flame. It seems a little bit more gentler, a little more environmentally friendly, and what I love about it is that you don’t have to go to a big industrial warehouse, like a crematory, to do it. A family can have a nicer area that’s just in a nice, beautiful, safe room to have a little ritual and send their loved one off. IRA FLATOW: Can you legally cremate a body in an open air pyre, anywhere, in the US? CAITLIN DOUGHTY: Well, there’s one. There’s one public open air pirate in the Western world, and it’s in this tiny town called, Crestone, Colorado. And they have done the amazing feat of really stepping outside the American funeral industry, and doing all of their– if somebody dies, they come to your house, they help you take care of the body. And then two or three days later, they process to this gorgeous, open air pyre at dawn, and they set you a light, and the smoke twirls into the sky, and the flames rise up. And even if you’re not a spiritual person, it feels like a spiritual moment when you’re there. IRA FLATOW: Is it possible– you talked about this a bit in your book about composting. CAITLIN DOUGHTY: Composting. Yes. This is also– so similar to something like, alkaline hydrolysis or water cremation, body composting, or recomposition, is an attempt to replace cremation with a more environmentally friendly option. And this one’s still more in the prototype stage. It’s a friend of mine, Katrina Spade, who’s spearheading it. And they’ve done several experiments. One at Western Carolina University in North Carolina, where they put bodies in big piles of wood chips, and the idea is that it gets hot, and the microbes do their thing, and within a month, eventually, the body will be down to soil. It will transform into soil, including, the bones. CAITLIN DOUGHTY: So when you get back isn’t remains, what you get back is a whole new product. It’s soil. IRA FLATOW: So what I’m hearing you’re saying is that every state has different rules about how you bury a body? CAITLIN DOUGHTY: That’s what can make it difficult because every single one of these things we’re talking about has to be legalized, individually, in each state. It doesn’t happen at the federal level. So each state has to legalize water cremation, each state has to legalize recomposition, or body composting. It’s a fight at each level. CAITLIN DOUGHTY: What more would I like– Where would I like to travel? IRA FLATOW: Well, well, just as a mortician– someone with a funeral home is there anything new to learn about how bodies decompose or different ways of burial? CAITLIN DOUGHTY: Oh, there absolutely is. I can’t even tell you how many things I want to learn. I’m fascinated– So there’s a new thing called, conservation burial. And it’s, basically, taking– it’s the idea of natural burial. Just a simple burial with no embalming but it’s, also, protecting endangered land. Protecting land that might otherwise be developed on but when you bury your body there, they can’t develop on it. I say it’s like chaining yourself to a tree post-mortem. And I would like more big environmental groups to be involved in this and to really consider these beautiful spaces as the future of death. IRA FLATOW: Talking about the death with author Caitlin Doughty, author of From Here to Eternity. She’s a mortician, a funeral owner in Los Angeles, on Science Friday from PRI, Public Radio International. As you can see here, imagine there are a lot of people who would like to ask questions. Let’s go to Brooklyn with Randall. Hi Randall. RANDALL: Hi, Ira. Hi, Caitlin. RANDALL: Hi. I had a question about the mummification process in Indonesia. RANDALL: Is there an amount of time that the departed one stay with the family? And then, also, I was wondering if they do anything similar anywhere else in the world. CAITLIN DOUGHTY: Yeah. Those are great questions. So as far as how the actual mummification works, it was interesting because I would talk to different people and it was, sort of, the hush hush scandal. Some people would say, well, I only mummify in the old way, and the old way is using tea leaves, and tannins. Almost like you would leatherize a piece of leather to mummify the body. But then they would also say, but I know other people are doing it in the new way. And the new way is just formaldehyde or formalin like, an American embalmer would use to preserve a dead body. And it depends how long the person stays in the home. Sometimes it’s a couple of months, sometimes it can even be years that a person stays in the home until enough money is able to be raised for the funeral, for this to happen. And as far as it happening in other places in the world, they preserve their dead bodies with formalin, with these chemicals. We preserve our dead bodies with formalin, with these chemicals. It’s not all that different but we, of course, would think about bringing the dead bodies out as horrifying. But my question there is they have a reason for mummifying their bodies with all these chemicals. Why are we doing it, in the United States, if we don’t intend to bring mom out a couple of years later? IRA FLATOW: Let’s go to Jane in Mount Laurel, New Jersey. Hi, Jane. JANE: Hi. I think that, probably, the greenest way to dispose of the body is to donate it to a Body Farm. And there are, I believe, several of them around the United States where they study human decomposition. No embalming chemicals need to be used, and then once the body decomposes, the bones go into a permanent collection for research purposes. CAITLIN DOUGHTY: I’m totally with you. CAITLIN DOUGHTY: I agree and actually the composting experiments that I was talking about earlier were done on a Body Farm. That’s what Western Carolina University has. So I know that the woman who runs it was incredibly grateful that those people were willing to give their body up for this important research. IRA FLATOW: And quickly, there was some news this week about how bodies donated to science are, sometimes, sold off as parts or rented out. CAITLIN DOUGHTY: They are and people always ask me, shouldn’t we just donate our bodies to science? And I hate, hate, hate that, sometimes, I have to hesitate in my answer because things like that happen all the time. We do run into these– people are donating their body to science think they’re going off to cure cancer, and to study these very noble things but in fact they’re being used for plastic surgery training, they’re being used for parts, essentially, and if you’re cool with that absolutely give your body up to science. But if you’re not OK with that, please do your research before you decide to donate. IRA FLATOW: Thank you, Caitlin, for joining us, today. CAITLIN DOUGHTY: It’s a pleasure. Thank you. IRA FLATOW: Caitlin Doughty, author of From Here to Eternity: Traveling the World to Find the Good Death. If you’re looking for an interesting Halloween gift, this is a different kind of gift. A fascinating book and something you might want to read. We’re going to take a break, and when we come back– speaking of Halloween, we’re going to talk about spiders. Spiders are everywhere in Halloween decorations, right? Why do we have arachnophobia? Why are we so fearful of spiders? We’re going to learn how to identify the brown recluse, how spiders benefit us, and cool spider tricks that you can see right in your own home. Yes, you can try this at home. So stay with us, we’ll be right back after this break.